för att få reda på hur planerna lagts upp för att skapa en världspolis för en global slavstat - ett 1984 samhälle under Big Brother. While there are conspiracies going on in the world today, the pursuit of world government now is no longer conspiratorial in the sense of being hidden or secret. Rather, it's what socialist author H.G. Wells called "The Open Conspiracy," as prominent people such as Bill Clinton have openly written in support of world government. It will probably be a World Socialist Government, synthesizing western capitalism and eastern communism. In fact, Joseph Stalin in a speech at Sverdlov University in April 1924 pronounced that "the amalgamation and collaboration of nations within a single world system of economy... constitutes the material basis for the victory of Socialism." And regarding what world government will ultimately mean, it will be authoritarian and repressive, for as Lord Acton wrote: "Absolute power corrupts absolutely." In 1891, gold and diamond magnate Cecil Rhodes formed a secret society, the "Society of the Elect", to "absorb the wealth of the world" and "to take the government of the whole world," according to Rhodes. According to Prof. Carroll Quigley, Bill Clinton's mentor at Georgetown University, in The Anglo-American Establishment, Rhodes' conspiratorial secret society lasted almost 60 years. By that time, enough members of the society and Rhodes Scholars had penetrated the areas of politics, economics, journalism and education, so that the society was simply replaced by a network of power elite, who would openly pursue world government. "The [Rhodes] scholarships were merely a façade to conceal the secret society, or, more accurately, they were to be one of the instruments by which members of the secret society could carry out Rhodes' purpose." And in case anyone doubts the credibility of Prof. Quigley regarding this matter, The Washington Post article (March 23, 1975) about him and his information obtained from the power elite's "secret records" was titled "The Professor Who Knew Too Much." Cecil Rhodes' secret society was comprised of a small "Circle of Initiates" and a larger semi-secret "Association of Helpers" which formed Round Table Groups. Members of these groups along with members of the Fabian (Socialist) Society as well as "The Inquiry" (a group formed by President Woodrow Wilson's chief advisor, Col. Edward M. House) formed the Royal Institute of International Affairs in Great Britain, and its American branch, the CFR. Both Prof. Quigley in Tragedy and Hope and CFR member Arthur Schlesinger, Jr. in A Thousand Days have referred to the CFR as a "front" for the power elite. And in Men and Powers, former West Germany chancellor Helmut Schmidt referred to the CFR as "the foreign policy elite," which prepared people for "top-level missions" in government and "other centers of international policy" and "had very silent but effective ways of seeing to its own succession." Members of Rhodes' secret society networked with Fabian Socialists, who established the London School of Economics in 1895. One early Fabian, H.G. Wells, in New Worlds for Old explained what he called "a plot," whereby heads of state would come and go, but bureaucrats trained at the London School of Economics, for example, would remain in government making rules and regulations furthering the goals of the Fabian Socialists. Wells broke with the Fabians, not in terms of goals, but only in believing they should be open about them, as he explained the coming synthesis of western capitalism and eastern communism into a world socialist government. In this regard, he authored The Open Conspiracy: Blue Prints for a World Revolution (1928) and The New World Order (1939), in which he said sovereign states (nations) would end and "countless people... will hate the new world order... and will die protesting against it." "A world association binding together and coordinating regional groupings of states may evolve toward one universal federal government... World government is the ultimate aim, but there is more chance of attaining it by gradual development." Official report reveals multiple "failures", raises many questions, calls for heavier police presence in public but Government still will not allow a public inquiry and tells us they can't prevent next attack. Downing Street has again ruled out a public inquiry into the July 7 bombings, despite fresh calls from survivors and relatives of victims, reports the Evening Standard here in London. The ruling came as two official reports into the attacks concluded that the chances of preventing the July 7 atrocities could have increased if extra resources had been in place sooner. The reports, carried out by The cross-party Intelligence and Security Committee (ISC) and the Home Office also between them confirmed that two of the bombers had been under MI5 surveillance before the bombings. It was further revealed that a third bomber, Germaine Lindsay, was also known to MI5 who had reports, pictures and even his telephone number in its files. The ISC report claims that MI5 missed a catalogue of clues that could have prevented the bombings. However, the London Times reported last December that MI5 and MI6 had specifically warned Tony Blair before the July 7 suicide bombings that Al-Qaeda was planning a “high priority” attack specifically aimed at the London underground system. You can't have it both ways, either they "warned of a high priority attack" or they "missed a catalogue of clues", which is it? The source of this information was a leaked four-page report by the Joint Intelligence Committee (JIC), signed off by the heads of MI5, MI6 and GCHQ, the government eavesdropping centre. This indicates that good people within British Intelligence are desperately trying to get the word out that the official line is hokum. 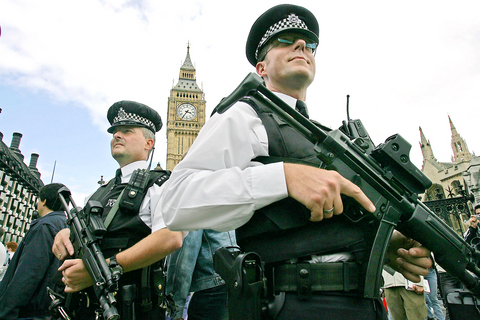 The ISC report has concluded that more police are needed on the streets of major UK cities and also warned that there would be an "inevitable" rise in intrusive activity by security services in the face of the terror threat. The report recommended a more transparent threat level and alert system, and called for improvements to the way the Security Service MI5 and Special Branches tackle "home-grown" terrorism. The members said they were "concerned that more was not done sooner" about the terror threat from UK citizens. No longer is "Al Qaeda" the main threat, now apparently all UK citizens could be terrorists. The official line on whether the bombers were acting alone or not is however still unclear. This latest report states that they "probably" received expert bombmaking assistance from an unknown individual, and they also had a series of highly suspicious contacts with an unknown individual or individuals in Pakistan for several months before the bombings. Previous to this the government had stated in April of this year that the bombers HAD definitely acted alone and that there was no Al Qaeda involvement. However, previous to that, in January of this year, a leaked MI5 report stated that they had "no insight " into whether the bombers acted alone, if there was a wider network connection, and if 7/7 was linked to 21/7. concluded DEFINITIVELY that there was no "mastermind" of the operation and it was not linked to the follow up failed operation on 21/7. And initially, in the weeks after 7/7 it was reported that there WAS an Al Qaeda Mastermind behind both operations, and that he had been caught in Zambia. This turned out to be Haroon Rashid Aswat. As soon as terror experts began to reveal that this man was an asset of MI6, the official line changed and has never been clear since. How can they go from knowing there was a mastermind, to definitively knowing there wasn't one, that the operations were not linked and the bombers acted alone to then having "no insight" on any of this stuff and then back again? Furthermore the initial story that the bombs were high powered explosives carefully created by a bomb making mastermind (who was also apparently captured, and has since disappeared), were then altered 180 degrees to the story that the bombs were put together from cheap homemade material. Now, the latest reports seem to have taken this full circle by stating that the bombers "received expert bombmaking assistance". It has also still not been made clear whether the bombs were on timers or were detonated by the bombers. Both these scenarios have been reported as fact. It is painfully clear that the authorities have changed the official line again and again according to information that is leaked out in the public domain. Still they will not allow a public inquiry. This is because someone knows that if a truly independent inquiry were held the whole sorry scam would be blown wide open. All these whitewash reports do is clear the government and the intelligence services of any blame. They have no basis in reality as is confirmed by the fact that they directly contradict previous reports without bringing any new evidence to light. Speaking to the London Guardian, one 7/7 survivor, Rachel North, made clear her dissatisfaction, saying: "These meetings that led to these reports took place behind closed doors ... They were internal investigations and I am not surprised that the politicians and security services have examined their work in secret and subsequently found themselves not to blame." The latest ISC report also concluded that although some attacks have been prevented since 7/7, the next attack cannot be stopped. So we have government reports stating that our privacy will be heavily impacted and a greater police presence is needed, but that they cannot prevent the next terror attacks. No longer are we being told that we must give up liberty for security, we are just simply being told to give up liberty regardless of security. It is not good enough to say that our liberties need to be restricted because of 7/7 but that we cannot have a public inquiry, and in any case that this will not prevent further attacks. It is also not good enough for the government to investigate itself and conclude that it needs more power and control over the population. They admit that they completely failed to protect the population yet the spin is that it was because of a lack of resources. So it was due to "a lack of resources" that 4 bombers got on to tube trains, and this requires thousands more armed police everywhere and new laws that simply do away with civil liberties altogether. The reason behind the decision not to allow a public inquiry according to Tony Blair's official spokesman is that the call for public scrutiny has to be balanced with "the need not to distract from the ongoing work of the security services and agencies". Funny that because leaked reports by the Joint Terrorism Analysis Centre (JTAC) have admitted that MI5 "have run out of leads" on the bombings. So they have exhausted their investigation yet we cannot now have a public inquiry because the investigation is ongoing. Again, you cannot have it both ways, which is it? We were told IMMEDIATELY in the days after the attacks that there was to be no inquiry, despite calls from the opposition party, because it would hinder the investigation. We were told by Lord Chancellor Lord Falconer that "now is not the time" for an inquiry, but for a decision on what legal steps were needed against terror. Since when do you debate and pass laws into public in response to an event of terrorism before you even know what has happened, who has carried it out or the reasoning behind it? We were told by ministers "For goodness sake, let's focus on what's important here and that is for the police and the security services to follow up every single lead they've got," . Well evidently they've done that now so can we have an inquiry please? We were then told AGAIN in December that there was still to be no public enquiry because it would divert attention and resources away from pressing security and community issues, and take too long. There will also never be a criminal trial because the bombers died in the attacks. More demands from MPs earlier this year told hold an inquiry were also dismissed out of hand. It seems that the government is above the law and only they will tell us what happened, why it happened and what needs to be done about it. The fallout of 7/7 is all around us in the UK now. This is the face of New Labour's "New Britain". Increased numbers of armed police everywhere with the right to now stop and search anyone they choose to under vamped up anti-terror laws. We now live in a Pro-active, police state, where you are a pre-criminal, that is a criminal until proven otherwise. And this is what our police now look like in "New Britain". They wear black ski masks, combat trousers and army boots, just like SAS agents. The Huge black machine guns armed police carry are totally impractical and should an incident occur where they would have to use them, the high output of rounds and spray of bullets they would fire would inevitably cause unnecessary casualties in a bustling city like London. They are purely designed to look effective and put the fear of life into the population, as are the ski-masks and the combat garb. The more immune people become to them, the more frightening and controlling they will become. This pattern will continue long as we keep letting the government take away our rights whilst fully admitting that they are failing us and thus must have more control over everything we do. In a free society the government is supposed to serve the population, not the other way round. This is precisely why there needs to be a public inquiry into 7/7 now, before more attacks are carried out and this course of action in the aftermath becomes the norm. What questions need to be raised in a 7/7 public inquiry? Check the London Bombings Archive for evidence of government prior knowledge, cover ups and complicity and post your comments here. Senate Minority leader Harry Reid (D-NV) calls this Congress the "most corrupt" in history.1 U.S. Representative Ron Paul (R-TX) often uses the term "police state" to describe our national state of affairs. George Bush is making the most expansive claims to unbridled power since America’s War for Independence, according to Senator Patrick Leahy (D-VT).2 Former U.S. Ambassador Joseph Wilson, who proved Bush lied to launch us into war with Iraq, says "fascist forces have seized control of the levers of power. "3 Americans are being told that their Republic has become a fascist police state—they just need ears to hear. In a fascist police state, the dictator secures his power with support from private corporations which are given special privileges and, thus, benefit from doing business with dictators. Continuously bribed by 28,000 corporate lobbyists in D.C.,4 Congress is doing its part to build a fascist state in America. During President Bush’s recent State of the Union speech, these tainted legislators perpetually rose to their feet to applaud the spewing of what a New York Times editorial called "misleading analogies, propaganda slogans and false choices. "5 Their bootlicking recalls a by-gone Soviet era when endless rows of robotic Central Party members applauded the likes of Stalin to ensure their next breath of oxygen. After passage of the Patriot Act of 2001, Rep. Paul told Insight Magazine that the 2,200-page bill was not made available to Congress to read before the vote.6 So the most corrupt Congress in history rubber stamped the most fascist legislation they had never read. Our constitution enumerates inalienable rights that are emphatically restated in the first 10 amendments commonly known as "The Bill of Rights." Under the Patriot Act, the "right" to free speech, peaceable assembly and security in one’s person, papers and effects have been relegated to "privileges" that government can take away at any time. Patriot Act authority has suspended the right to due process and a prompt and public trial; it even cancelled protection against cruel and unusual punishment. Agents serving the fascist state can freely wire-tap our phones, enter our homes/offices, search and seize without warrant and detain us indefinitely without charges—ostensibly to keep America safe. As we go to press, the original Patriot Act, which had a sunset clause, is now in the final stages of being amended and passed by Congress as a permanent feature of America’s fascist landscape. As we witness the progression of runaway fascism under the administration of Prescott’s grandson, we must recall that the Skull and Bones syndicate, so adept at bringing nations to heel with war and revolution, created the CIA in 1947 under direction of Bonesman Robert A. Lovett.16 Our burgeoning fascist state is a raging metastasis of the syndicate’s obsession with power, made possible by it’s ritualistic secrecy and iron-fisted control of U.S. intelligence for the last 60 years. Our present generation of ruling Bonesmen is now brazenly merging the hideous Soviet and Nazi models into a hybrid for the new U.S. Homeland Security state. In 2004, a clueless and/or compromised Congress rubber-stamped the Intelligence Reform Act, a bill weighing in at over 3,000 pages. This Orwellian horror created the Department of National Intelligence (DNI). All 15 U.S. intelligence agencies now report to DNI mega-commissar John Negroponte, a veteran of the Iran-Contra scandal. This shady new law also establishes a counter-terrorism center and provides for a spy satellite network capable of monitoring private communications systems. It mandates that all drivers licenses and birth certificates be standardized, thereby creating a national ID system. Some provisions of the Intelligence Reform Act were classified "top secret" and congressmen were not allowed to read them.17 Americans have yet to discover what malignant ramifications the DNI may hold for the future. In June, 2005, George Bush placed a portion of the FBI under his personal control, creating the National Security Service. This secret police apparatus, to be operated by the White House, will have no congressional oversight.18 In October, 2005, Bush created by executive order the National Clandestine Service, a new sticky arm of the CIA empowered to carry out covert operations, spying and dirty tricks within the United States.19 How many Gestapo units does a Fuhrer need? Homeland Security is grooming law enforcement agencies across the nation to keep a suspicious eye on everyone. A 2004 Homeland Security memo22 sent to police departments and sheriffs’ offices all over the nation instructed law enforcement personnel to watch the masses for body language since a scratch here, a twitch there could give away a would-be terrorist attempting to blend into everyday American life while planning an attack. The memo warned of anyone who shows arrogance or expresses "dislike of attitudes and decisions of the U.S. government," implying that dissent is synonymous with terrorism and to consider as suspect an emotionless face or "a pale face from the recent shaving of a beard." It also warned that a terrorist might find waiting in a grocery store line intolerable. So we learn that to prevent suspicion, good Homeland citizens must refrain from twitching or scratching in public and maintain a happy face at the grocery store. Special operations teams now roam the planet to perpetrate Rumsfeld’s personal black ops missions with no records kept and no questions asked.29 Some of these operations are headed up by Lt. General William Boykin30 who calls the U.S. Army the "House of God"—war, militarism and coercive surveillance being a sort of fascist religion, you see. Additional police state spawn known as the "Project Bioshield Act of 2004," authorizes the secretaries of the DHS and the Department of Health and Human Services (DHHS) to take virtual control of the bodies of all American citizens during a national emergency. Health officials are empowered to compel everyone to receive state-mandated medications or vaccinations and to comply with quarantine orders.37 With lavish Project Bioshield funding, state and local agencies have been drilling for the day when citizens are commanded to line up for the bio-terrorism counter measures being brewed for them by large pharmaceutical companies under lucrative federal contracts. Now if citizens are sickened or killed by Homeland’s compulsory bio-warfare drugs and vaccines, they can neither sue the manufacturer nor seek compensation from the government. Hundreds of military personnel injected with experimental lots of squalene-contaminated anthrax vaccines have also developed painful, incurable chronic illnesses.40 When Homeland needle Nazis start forcibly whacking the population with the new lipid-laced vaccines, Americans will truly understand the meaning of "bioterrorism." • The most outrageous report is that of a young high school student in North Carolina given an assignment to illustrate his rights under the Bill of Rights. He took a photo of a George Bush poster hanging on the wall next to a "thumbs down" sign. A Walmart employee freaked when he developed the photo and called the police, who then called the Secret Service. The Secret Service went ballistic. They grilled the principal and the civics teacher, confiscated the photo poster and threatened to indict the terrified student.48 Now this kid truly understands the new Bill of no Rights in Fascist America. Especially galling is that all of this lunacy has blossomed since the so-called terrorist attack of 9/11. As millions of Americans now know—the official 9/11 fable violates the laws of natural science. • A jet liner can’t disappear into a hole less than half its size without leaving wreckage (Pentagon). • Hijackers can’t be killed in plane crashes and later be found alive and living lawfully in various locations throughout the world. • Smoldering fires too cool to bend, let alone melt steel girders can’t collapse two skyscrapers simultaneously at the speed of gravity (Twin Towers). Because these sociopaths got away with 9/11, the door remains wide open for them to unleash future fake attacks to leap frog their fascist plans forward. According to research of Dr. Len Horowitz and others, the anthrax strain mailed to enemies of the state originated in a CIA research program. It is apparent that even the anthrax scare was an inside job.56 If America gets the flu, will it be from "the birds"—or from "the boys?" In October 2005, Bush announced that he was considering plans for federal military personnel to enforce quarantines in the event of a bird flu outbreak. Bush believes that he has the power to waive the 1878 Posse Comitatus Act, which prohibits federal military personnel from committing law enforcement in the United States. John Brinkerhoff, deputy director of FEMA, has developed martial law implementation plans to be enforced by U.S military personnel. When implemented, the declaration of martial law will completely trump the sovereign powers of the several states. Halliburton subsidiary Kellogg, Brown and Root has been awarded a $385 million dollar contract by Homeland Security for construction of detention and processing facilities to be made ready in the event of a national emergency.67 Brown and Root has been part of the Skull and Bones nexus since its inception at the turn of last century.68 Like Halliburton, it has grown fat on blood-money gleaned through decades of perpetual war, including the present conflagration in the Middle East. If the fascists batten down totalitarian power domestically, Kellogg, Brown and Root will likely profit immensely from the erection and maintenance of such prison camps expected to dot the land of the free if the fascists launch a military takeover. The grand finale of American fascism is yet to come. No totalitarian ruling structure would be complete without an oppressive identification system that allows the dictator’s henchmen to access birth-to-death information on every citizen listed in the national database. It’s becoming obvious that no one is intended to escape the dictator’s dynamic plans to force upon us national ID cards and, eventually, under-the-skin identification implants and a satellite tracking system able to keep each of us under round-the-clock surveillance. We are told that banks and credit card companies applaud a national ID system.76 Instead of using bank credit and debit cards, people may eventually make purchases by showing their biometric Homeland ID cards. These transactions will then end up in the federal database, permitting fascists to assess our motives and intentions by monitoring our cashless sales and purchases. Officials at all levels will also be able to feed a citizen ID number into a wireless handheld or laptop device that connects to the national database. They may then instantly access that person’s financial transactions, credit reports, medical and vaccination records, school records, driving records, political and religious affiliations and anything else that might have been inserted into his file by Homeland spies. Can you say "Mooo, baa baa" and "oink?" If he could he see his old partners now, Adolph might be green with envy, having been consigned to the barbaric practice of simply tattooing ID numbers on his slaves. ADS and its subsidiaries, including VeriChip Corporation, have developed several kinds of implantable subdermal chips. One type is the FDA-approved VeriChip, that spits out the implantee’s ID number when it is scanned by a chip reader. VeriChip Corporation recently announced that already 68 U.S. medical facilities, including 65 hospitals, have now agreed to implement its VariMed system for patient and staff identification and tracking.91 This includes both implantable and wearable ID chips that will tie the health records of patients into Big Brother’s electronic national database. In New Jersey, Hackensack University Medical Center and Trinitas Hospital, will be implanting patients in their emergency rooms.92 These crafty hucksters are targeting the most vulnerable people first-- the injured and the sick who are desperate for care, plus the homeless and mentally retarded who can’t defend themselves. As injectable ID chips come on line, Homeland Security is paying numerous corporations to develop a national network of object-mounted wireless sensors that will be able to read implanted human chips.93 This network of sensors will eventually relay information on the whereabouts and activities of implantees to teams of surveillance specialists. Conceivably, every wall socket could become a reader for implanted chips. Digital Angel is the ultimate in totalitarian control, to date Big Fascist Brother’s most "cool tool." Reportedly, these biochips will be capable of relaying information to both satellite and ground stations. Oracle is backing a powerful new 999 medical biochip that contains a Pentium microprocessor just 2mm square. This computerized sensor is being implanted into diabetics by doctors experimenting in London.99 Text messages from the chip’s sensors will travel through flesh to a cell phone tethered to the patient, then on to monitoring stations. Powerful web-enabled tracking chips which send and receive information at long distances are ultra radiation-intensive. Big Brother’s most cool tool is "hotter" than Hades. Bodies bearing these chips will be continuously bombarded with incoming and outgoing microwave radiation, most likely in the megahertz or gigahertz range, the same frequencies employed by cell phones. Satellites communicate in microwave frequencies. Last October, Time magazine gave a plug to implantable ID and bio chips, stating they could save lives.102 But people who have active chips imbedded in their bodies will be dead men walking. The human body is not compatible with microwave radiation and bodies subjected to it 24-7 will ultimately be destroyed. In the Homeland Security state, microchip implants of various kinds will likely become as common as cell phones. Eventually, citizens who refuse to accept identification chips may be denied access to services and benefits by heel-clickers supervising the national ID system. And thus we see how cleverly Americans are being manipulated into this crucible by killers in the White House, and by the most corrupt Congress in history and by the amoral, money-grubbing corporate megalith they all rode in on. In the name of national security and public health—millions of non-discerning citizens will allow themselves to be micro-chipped like dogs, tracked by satellite and stripped of all privacy as they become the virtual slaves of a techno-tyrannical surveillance state. In part two of this discussion, we will document the latest scientific information on the devastating health effects that will result from the implanted microwave devices used to track and control slaves of the state. If you feel a creeping allergy to the fascism we have documented here, you can do something about it now. Make the choice right now to keep microwave-driven wireless devices as far away from your body as you can get them. These devices include all wireless telephones—both cell and household cordless—plus wireless computers, headphones and all other gadgets empowered by megahertz or gigahertz frequencies. If you must use wireless phones for business or emergencies, use speaker phones only. Never put a wireless device on your body, least of all near your precious brain. You are going to NEED a brain to survive—and ultimately defeat—fascist America. Microwave transmitters are not toys; they are weapons. Brother’s wireless revolution has induced millions of fools to voluntarily point these weapons at their own heads. The wireless revolution is not only about money, it is about control. It is about acclimatizing the masses to accept the dehumanizing parameters of Orwellian surveillance. As the police state broadens with the help of Homeland’s cooperating telcom players, it is conceivable that such devilish frequencies could be used with evil intent against all those who are "connected." These hapless victims, driven to and fro by fascist propaganda, will be oblivious to what is channeled into their sizzling brain neurons, into their internal organs, into their very souls by the deadly wireless transceivers they bear in their flesh. He is right! America’s parasitic police state and all of its perversions absolutely ARE a soul thing. So the time has surely come to stand back and scrutinize this illicit monstrosity which so brazenly deceives, swindles, sickens and murders the people to gain power and wealth. Please start thinking about how you and your family are going to exist for a time in a demon-driven world where deadly radio frequency identification implants become mandatory. The more people who courageously resolve to stand firm against this mighty beast, the safer we will be until we get through this miserable, and hopefully final fascist interlude in human history.